Every Stax ‘earspeaker’ is an electrostatic design. 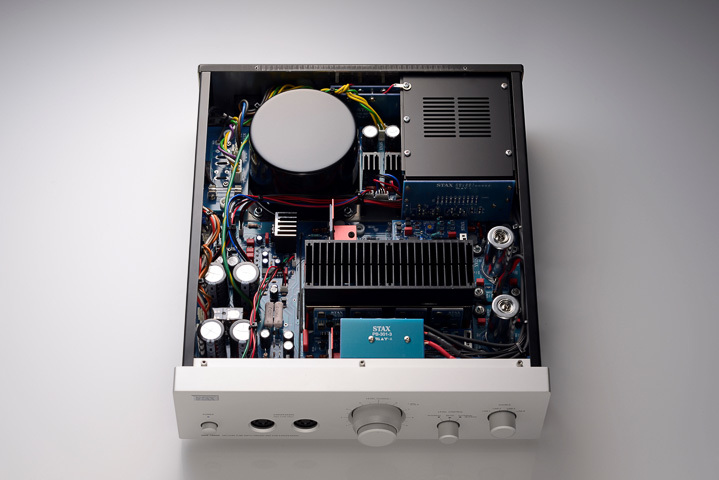 Every electrostatic needs a specialist, dedicated high-voltage amplifier (Stax calls it an ‘energiser’). Stax makes more top-end earspeakers than it does energisers, so there’s call for a really top-notch energiser from the brand to match the SR-009 and the new SR-009s. The SRM-T8000 is that energiser. Two years in the making, the hybrid SRM-T8000 is the first of what Stax classes as a new ‘T’ series energiser. Instead of relying on a combination of FET input stage running in Class A and valve output stage using 6FQ7 valves, the T8000 features a pair of 6922 double-triodes in the input stage and a solid-state output stage. This form of hybrid amplifier circuit is commonplace in traditional two-channel amplifiers, but has been harder to utilise in Stax energisers because of the high impedance of an electrostatic transducer. The valve circuit board is independent to the rest of the circuit, and the valves themselves are screened and damped to reduce vibration and microphony effects (while the more sceptical will dismiss the impact of microphony on solid-state electronics, such properties are readily demonstrable with valves). The one problem here is those valve cans will limit the amount of tube rolling for those who enjoy such things: no valves significantly physically wider or narrower than the supplied models. However, the anti-vibration goals extend to the feet, which are made of an aluminium ring filled with an unnamed but grippy ‘vibration-proof compound’, and the volume pot, which is internally shielded. The big ‘first’ for the SRM-T8000 – which goes some way to explain the reason why this energiser is roughly twice the width of its counterparts – is its use of a large-capacity toroidal transformer, mounted on a non-magnetic aluminium chassis. It has both balanced and single ended inputs – balanced sounds best. The T8000 has a difficult gap to fill, as it’s one that is notionally at least already filled by several well respected third-parties. Stax energisers have a reputation among the electrostatic cognoscenti for being the default choice but shopping around is a worthwhile exercise. Which means a truly top-end Stax model needs to excel. And the SRM-T8000 certainly excels when it comes to midrange detail. Every scintilla of information, especially in that all important midrange, in a recording is presented here, in a precise and orderly manner. It’s tough on recording engineers, in a good way: if the engineer was ‘winging it’ and the mix isn’t perfect, every drop-in, and every slightly fuzzy panning instrument placement is on show. On the other hand, those unsullied recordings made with minimal equipment are wonderful.